Healthy comfort food, absolutely delicious! Note: For the apples, I used honeycrisp, but granny smith would be good as well. Any slightly tart variety is fine. 1. In a large saute pan, add the butter and heat the diced apple on medium. 2. Next add 1/4 tsp stevia, 1/4 tsp cinnamon, pinch of salt, and a pinch of nutmeg and stir to incorporate. 3. Allow to cook down, stirring occasionally, for 10-12 minutes. Apples should be fairly translucent. 4. Heat griddle to medium. Spray with cooking spray. Add the rest of the ingredients to the blender and blend for about one minute. 5. Then let the mixture sit for a few minutes to thicken. Add 3/4 of the apples to the mixture, setting aside 1/4 as the topping. 6. Pour 1/3 of the batter onto griddle. Flip pancake once bubbles appear and start to set on top. Continue twice more, for three cakes in total. 7. Top with apples, and enjoy with your favorite syrup or whipped cream. 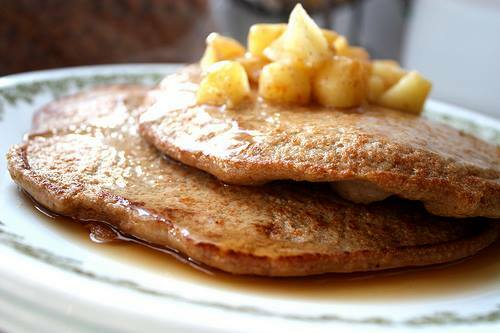 This entry was posted in Breakfast, Desserts, Oatmeal, Pancakes. Bookmark the permalink.